THE DIVINE ONE WHO RULES THE MOUNTAINS is one name for a brownbear. 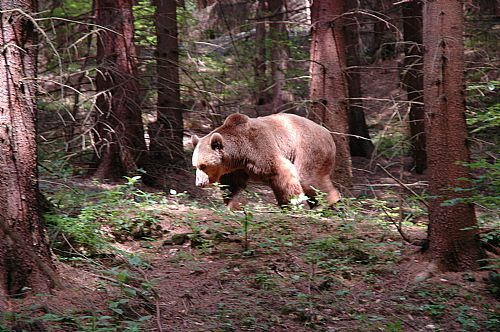 The latin name for the Eurasian brownbear is "Ursus Arctos". In the old times often people used an synonymy for the bear and avoided the generic word (the word equivalent to our word BEAR). This was because the belief was that you would get bad luck to mention the bear by it´s real name. Commonly the words "grandfather" and "grandmother" was used by both subarctic American Indians as by Northern Europeans and Asians. one" , "That big hairy one" , "Sticky-mouth" , "Dark thing" , "The animal" , "Apple of the forest" , "Pride of the woodlands" , "Famous Lightfoot" , "Blue-tail" , "Snub-nose" , "The old man with the furgarnment" , "Broad-foot" , "Owner of the earth" , "Great man" and one last , maybe the most prestigous one "THE DIVINE ONE WHO RULES THE MOUNTAINS". So in other words , "nicknames" was used a long time agooo!! The brownbear was often honoured during hunting rituals by most of our forefathers . By honouring the bear the hunters imagined they would achieve some of the bear powers. To fight like a bear and possess bear power was of course helpful.